I’ve always got craft sticks in the supply closet. We’ve used them for so many things, from picture frames to bracelets, and even for learning games like Math Fact Sticks. There are so many things you can do. 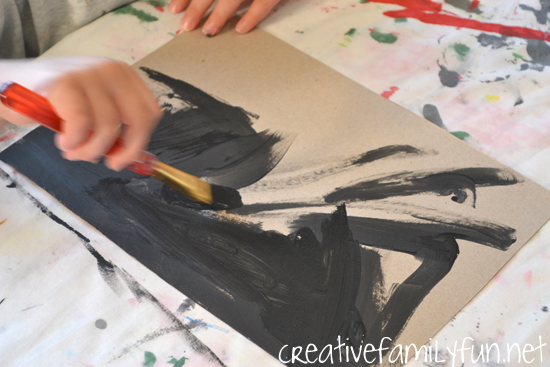 This time, we kept it simple with a creative process art activity. 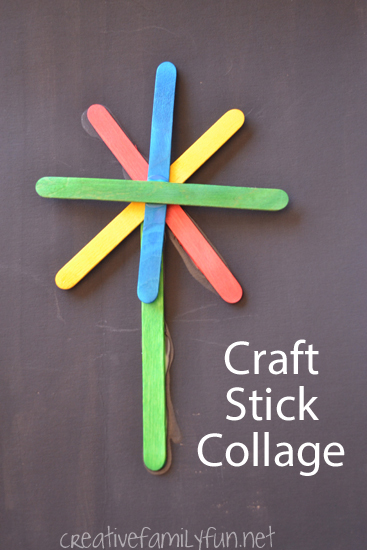 We used a pile of colored craft sticks to make this Craft Stick Collage. 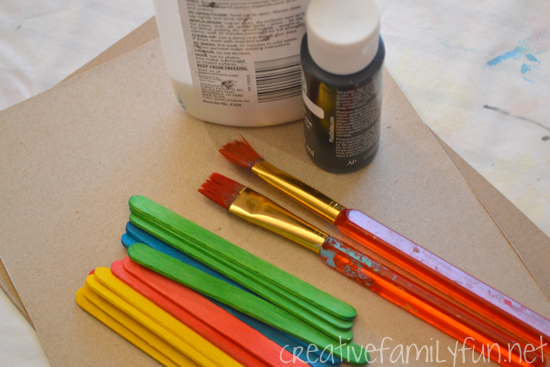 If you don’t have any colored craft sticks, you can add an extra step to this project and paint plain crafts sticks in a few vibrant colors. 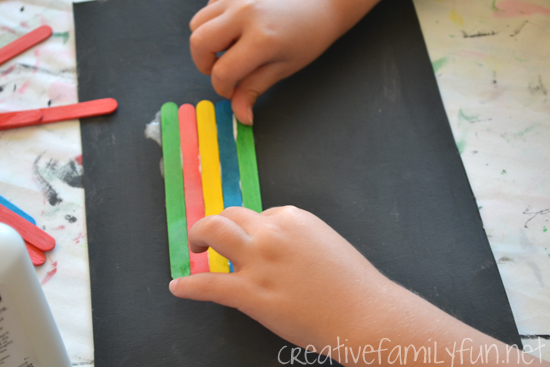 Since we were going to be gluing our craft sticks, I knew we needed something sturdy as a canvas. Plain paper would just not work. So, we went to the recycling bin for a cereal box. We cut off the two largest panels to use for our canvasses and painted them black. The colors of our craft sticks would pop so much more against the black than they would have against the cardboard brown. Once the paint was dry, it was time to create. We put the pile of crafts sticks in the middle of the table, pulled out a couple of bottles of glue, and got to work. There were no rules and no suggestions. I walked away for awhile to get the girls to start creating without my input. One of my daughters stacked and one laid them all side-by-side. One started creating a colorful flower. One had an idea in mind before she even started and the other went with the flow to see what would happen. 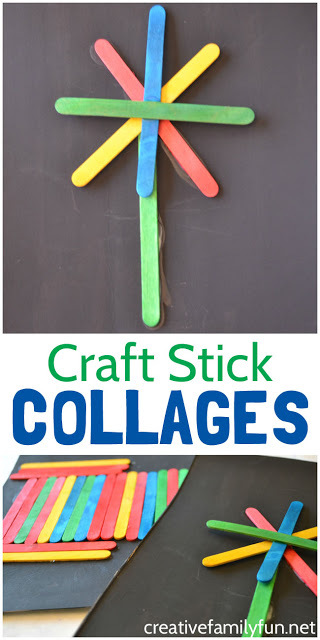 I love the way their craft stick art projects turned out. I love the way their minds work. 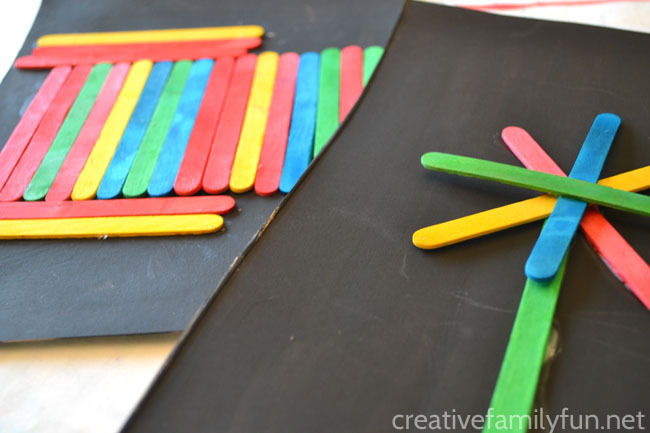 The contrast of the colored craft sticks with the black canvas on our craft stick collage was so striking. I’m so glad we used that instead of plain paper. I think I need a pile of black cardboard around for creating. It would be a great canvas for chalk pastels and other collages. What would you use it for? 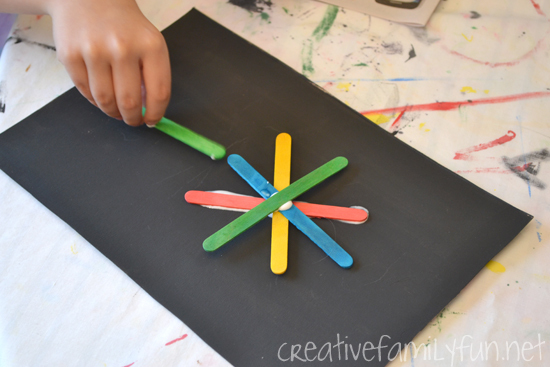 Are you looking for more preschool art projects? 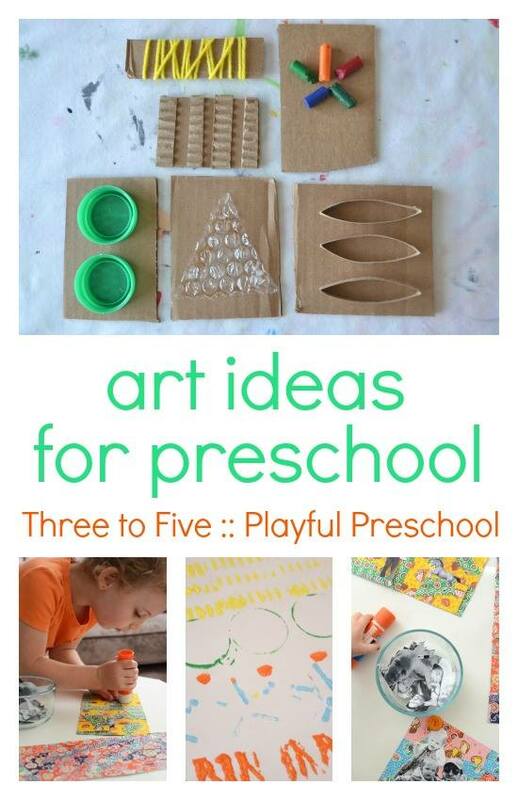 Check out Three to Five: Playful Preschool. Get over 25 activities, 10 printables, and links to even more play-based preschool activities in this new e-book. Download it here.